You complain, we listen. That’s how we roll. freenode provides discussion facilities for the Free and Open Source Software communities, for not-for-profit organizations and for related communities and organizations. Ok, so… Google Talk it is, then. 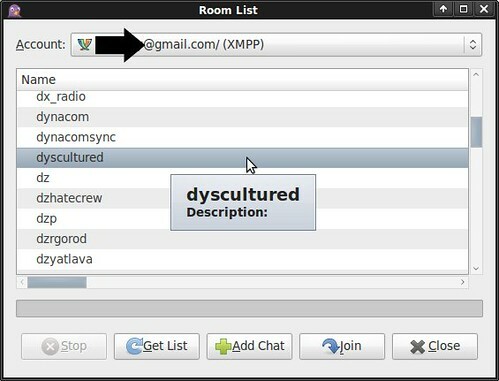 Alternately you could scroll through the room list at conference.jabber.org and find us there. And we are indeed there — see? 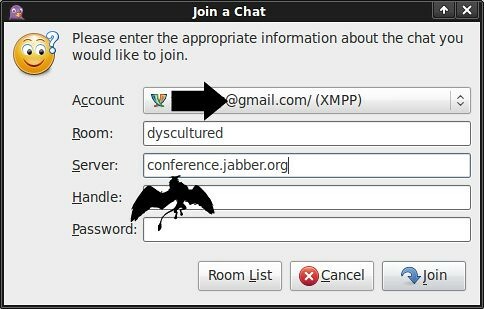 If you’re still having trouble just sign up for a jabber.org account and go back to step one. I’m guessing Mike and Anthony will be keeping the CoveritLive chat going for at least another week or two. But not me. I’ll be hanging with the cool kids on Jabber. Join me, won’t you? Andrew, I just want you to know that if anything goes wrong with this, I won’t blame you. I will, however, blame the entire Linux community for no logical reason whatsoever. I may also blame Merv Griffin just for kicks. Again, CoverItLive will be up, so if you’re feeling “safe” you can still use it! Blame the global Linux community, eh? I’m up with Adium. Why do developers like ducks to adorn their apps? Looks like Andrew and Alex (X96 Design) are in the room already. Where is the audio going to come from?